مشرق نیوز:‌ محمد خاتمی در جمع تعدادی از دانشجویان گفته:"من شنبه پس از انتخابات به دیدن میر حسین موسوی رفتم و به او گفتم ممکن است تخلفی در انتخابات صورت گرفته باشد اما تقلبی که رای تو را عوض کرده باشد اتفاق نیفتاده است. من مطمئنم که شما رای نیاورده ای." خاتمی همچنین تاکید کرده من نباید پاسخگوی عملکرد موسوی و کروبی باشم. خاتمی در عین حال به این سوال پاسخ نداده که چرا از عملکرد سران فتنه تاکنون اظهار برائت نکرده است. به نظر می رسد خاتمی هنوز نیم نگاهی به پایگاه اجتماعی فتنه دارد. Oh by the way You 'Ex Greens' now 'Pro Obama' Remember this ? Green Protesters Insult Fellow Iranian Monarchists tearing up their 'Sun and Lion' Flags and lecturing them on 'democracy' during protest Against Election Fraud in Iran in 2009. Federal building Los Angeles. It is more likely that this is another one of those fabricated stories that the pro-regime media produce, as argued here. Khatami will probably react to this in the next couple of days. What a filthy crappy individual this man is! He is rotten to the core! كليك كوBelieve in a democracy that leaders and representatives are controlled by members at all times. That believe that he was a good trustworthy mullah! A good mullah is a dead mullah! Unfortunately as I have said time and time again majority of Iranians are wild animals that can't tell the difference between good and bad. That's why they chose Khomeini in 1979, and chose this a hole thinking that a akhoond will save them . Majority of Iranians lack any correct politica sense ! Never trusted him, never will. Iranian media is full of false news and this may be another case. Let's first ascertain that this is the case and not a twist of his words. 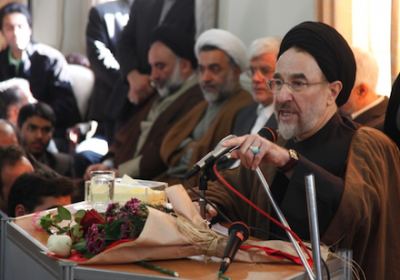 Khatami admists that he does not believe in Free elections. How about Mousavi and Karoubi?? this is why other than the usa and uk and france, very few outside and within iran support khatami as a supporter for the opposition within the iri or outside the iri. Once a thief, a liar, a murderor, for the corrupt islamic authorities who condone such practices its very tough to break the habit and khatami has no intention of trying. The new generation of Iranians will keep in mind the lessons learned, Iran needs more moderates and less extremists like this well known an anti-royalist and anti-monarchist extremist Khatami.